A 360 foot high flag post, said to be the country's tallest, was inaugurated on Sunday at the India-Pakistan Attari Border, just a stone's throw from Pakistan. 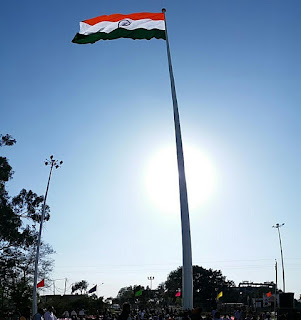 Punjab Minister Anil Joshi inaugurated the country's largest tricolour on the tallest flag post measuring 110 metres in length, 24 metres in width and 55 tons in weight. Built at an approximate cost of Rs.3.5 crore. At present, the tallest flag is in Ranchi which is 300-feet high.